I’ve kept photos of this sparkling sensation hidden away for far too long… and now she’s just screaming to get out and show you all her stunning self! 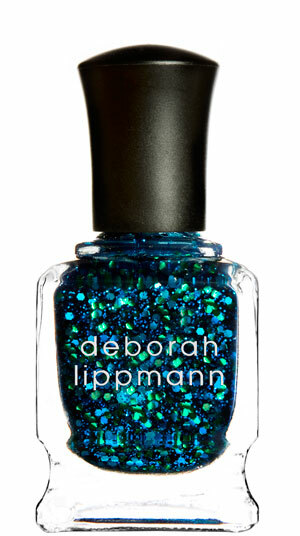 Yes, it can only be Deborah Lippman’s Across The Universe. All the rumours you’ve heard about this polish are true. It IS the most awesome thing I’ve ever set eyes on, without there even being a hint of holo magic in sight! 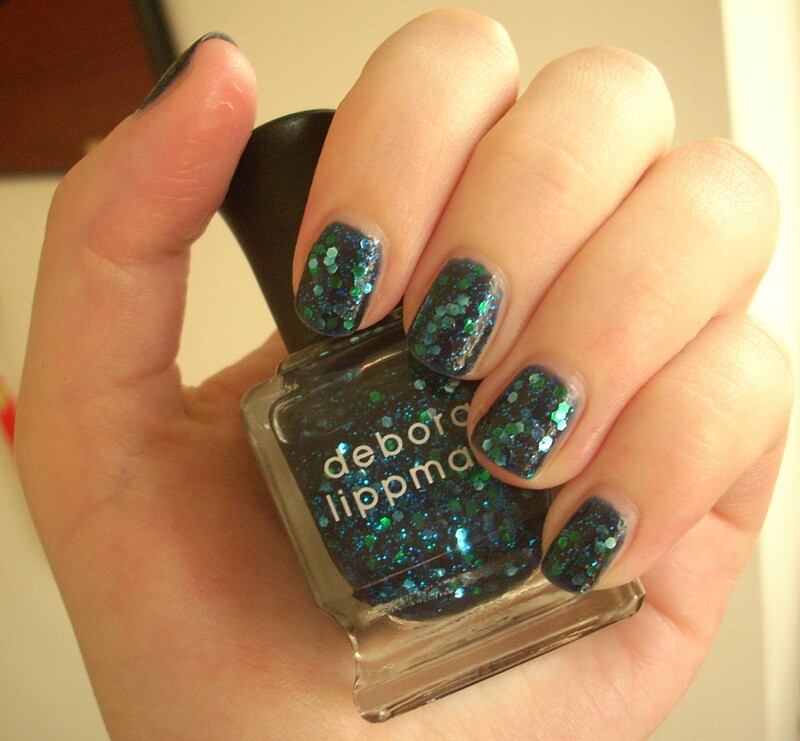 Across The Universe is a truly AMAZING polish – a dark blue jelly base that has tiny specks of blue glitter, plus bigger hexagonal pieces of green, aqua and blue glitter, floating in it. The results are truly breathtaking and however many pictures you take of it will never be enough; I was receiving compliments about this polish all week long! It’s supremely strikingly sparkly, yet somehow without being too garish or OTT. Layering up the translucent navy base with all those glimmering sparks suspended in it results in a gorgeous glittering depth – so it really does resemble a beautiful night sky, far off in some cosmic star-strewn galaxy… or a glistening magical paradise deep in the depths of some enchanted ocean. For a polish with such big pieces of glitter in, I found it extremely easy to work with. 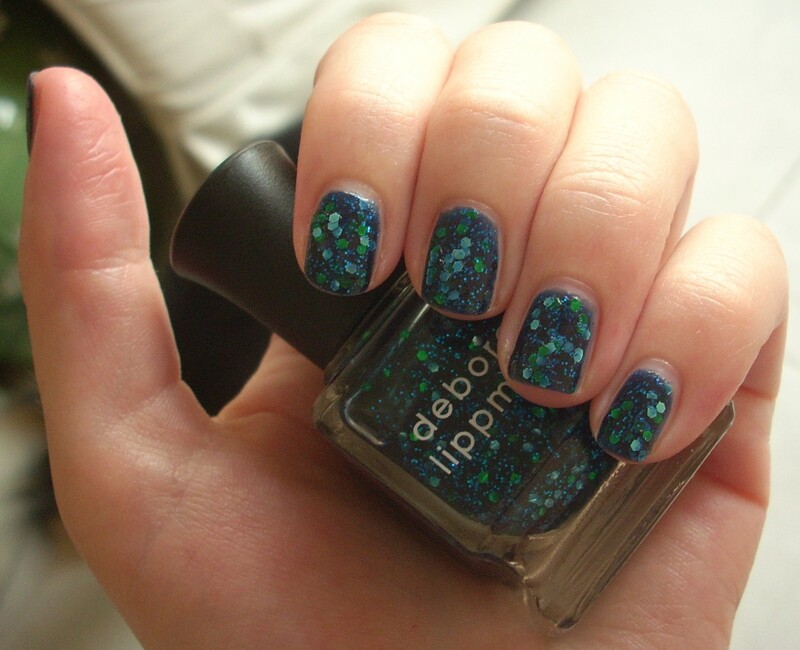 The glitter didn’t settle in clumps or at the bottom of the bottle – instead, it spread evenly around the nail and there was a nice random assortment of sparkle applied with each sweep. The jelly base is just the right thickness to allow the glitter to shine through wonderfully yet build into that dazzling depth I spoke of earlier. The drying time was fairly quick and the surface didn’t feel bumpy, rough or uneven – instead, the finish was smooth and glossy, another rarity with heavy glitter lacquers. I achieved a really neat nail with barely any need to clean up afterwards, so I guess the Lippmann brush must be pretty good too! It’s basically polish perfection. I absolutely love the thought that has gone into Across The Universe. The cool blue, aqua, cyan and green shades of glitter are absolutely gorgeous in their own right yet fit oh-so-perfectly with each other… and entirely complement the whole package, right down to the polish’s entirely fitting name! I also love the swirl of different sizes and colours of sparkle you get with each stroke, which just builds in awesomeness with each coat. It looks great as an accent to black, to jazz up a casual outfit or to just totally up your glitz factor yet it’s dark and somehow subtle enough not to totally take over a look. Ugh, seriously, I wish I could cover everything in life with a coat or two Across The Universe – it would be a much more beautiful place! What’s more, I didn’t even find it that difficult to clean off either! [I think the smooth jelly base helps a little with removal.] I know varnish aficionados will recoil in horror but with chunky glitters like this, I always wait and chip off as much as possible – the strength of my Nail Tek II base coat means, for me at least, that chipping is a less painful process for my nails than rubbing acetone for ages on dry fingers. 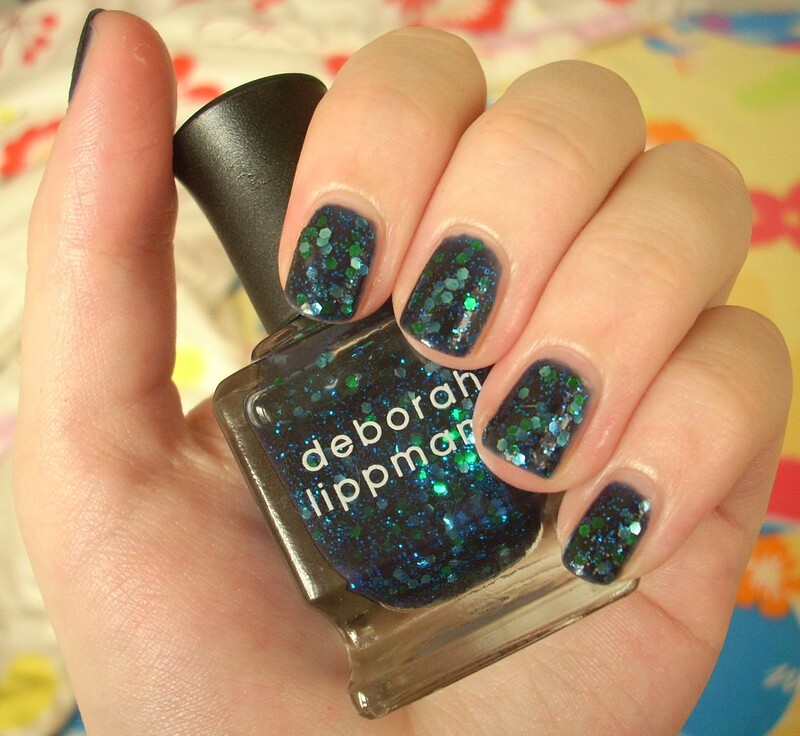 Incidentally, this was my first Deborah Lippmann. It was very expensive and there’s no way I’d pay that sort of money for one of her crème polishes, but Across The Universe is unique enough, beautiful enough and performs brilliantly enough all-round to make it worth the purchase. The chunky bevelled bottle totally adds to the overall deluxe feeling. You might think I’ve gone a bit over the top for a nail polish (in which case, have you read this blog?! What are you doing still here?!) but Across The Universe really is a show-stopper. It’s almost poetic in its perfection. The best nail polish I own. And that is all there is to it. 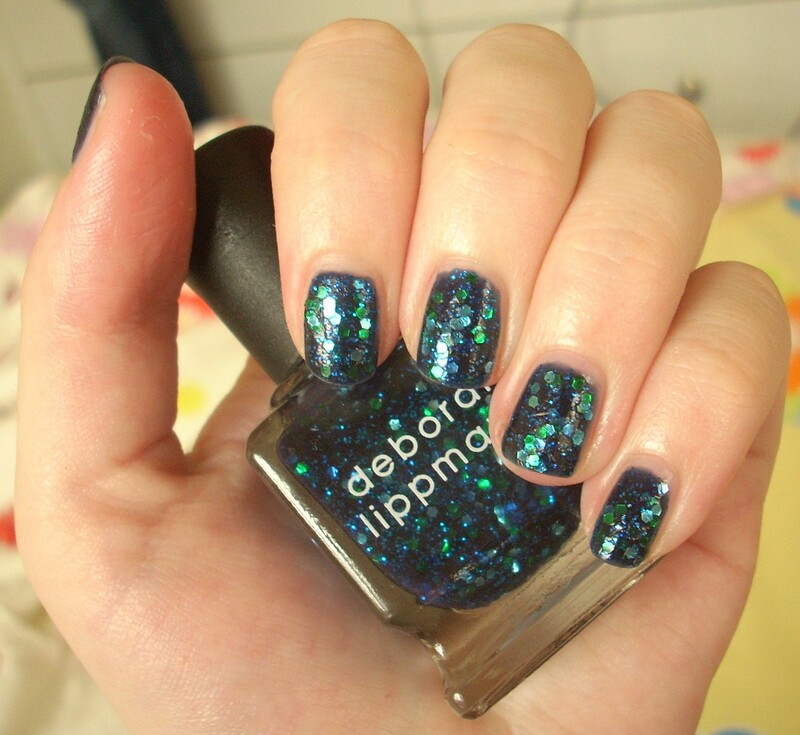 This entry was posted in Beauty and tagged Across The Universe, Beauty, best glitter polishes, blue, cosmetics, Deborah Lippmann, EPIC, glitter, luxury cosmetics, make-up, nail lacquer, nail polish, nail varnish, review, swatch. Bookmark the permalink. Glad Across The Universe has another fan! I LOVE it too – can you tell?! I presume you were looking for it at Joyce, who are useless at knowing their stock levels, when new stock will come or putting away testers for out of stock items! Actually there is another store in HK that sells Lippmann – I think it’s called Kiss Nails (or something like that), there is one in Causeway Bay Windsor House and another in Tsim Sha Tsui iSquare. Hopefully next time you can try there if Joyce fails you again!